Company: NMB Semiconductor Co., Ltd. 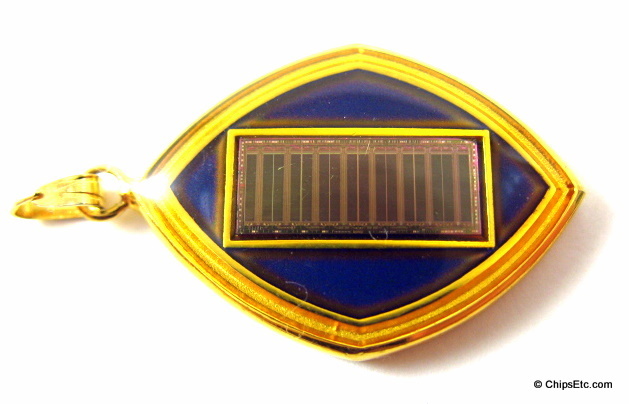 This gold tone and acrylic necklace pendant contains a 4Mb DRAM memory chip. 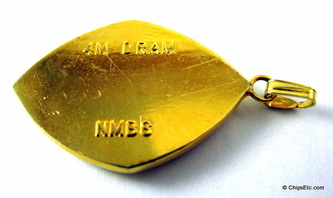 Marked on back "4M DRAM NMBS". NMBS (NMB Semiconductor, Ltd.), a semiconductor foundry, manufactured DRAMs for Intel in 1990 when the two companies briefly formed a joint venture called "Intel / NMBS DRAMS Fabrication Co." In 1991. The partnership was short-lived but Intel and NMBS came to terms on a new pact under which NMBS agreed to serve as a foundry for Intel's flash memories. In 1992, NMBS and Ramtron International Corporation introduced their high-speed 4-Megabit DRAM. The new DRAM's, including 1Mb and 4Mb versions, were the first commercial products resulting from a multimillion-dollar co-development agreement and manufacturing alliance signed in 1988 between the two companies. The 40 nanosecond (NS) maximum access time 1-million bit and 4-million bit CMOS DRAMs were the world's fastest JEDEC standard products at the time. 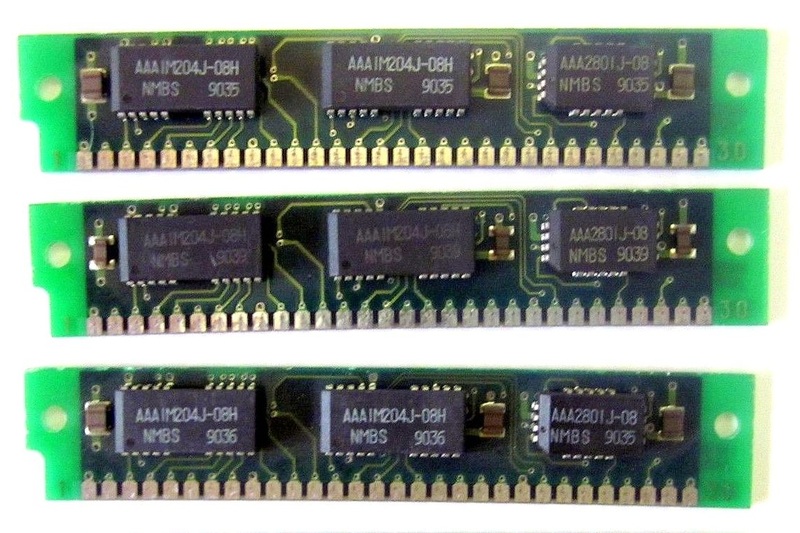 The 1Mb and 4Mb DRAM products, co-developed by Ramtron and United Memories, Inc. (UMI), were manufactured at the NMBS $300 million Large-scale integrated (LSI) circuit fab in Tateyama, Japan which first opened in 1984. NMBS DRAMs address the high-speed segment of the growing DRAM market, which was estimated to be $5 billion in 1992. Applications for the high-speed DRAMs include main computer memory, digital television, facsimile machines, and solid state replacements for magnetic disks used in computer systems. NMBS expected the 40 nanosecond DRAM products to gain rapid acceptance among manufacturers of 32-bit personal computers and high-performance workstations. Controlling interest in NMBS was sold to Nippon Steel Corp.in 1993. "RAMTRON AND NMBS CO-DEVELOPED 40ns 4Mb DRAMs ENTER PRODUCTION"
Ramtron International Corporation, a majority-owned subsidiary of Ramtron Holdings Ltd. (ADR - NASDAQ: MEMRY), and NMB Semiconductor Limited (NMBS), today announced completion of their high-speed 4-Megabit (Mb) Dynamic Random Access Memory (DRAM) development program. The DRAMs, including 1Mb and 4Mb products are the first commercial products resulting from a multimillion-dollar co-development agreement and manufacturing alliance signed in 1988 between the two companies. The 40 nanosecond (NS) maximum access time 1-million bit and 4-million bit CMOS DRAMs are the world's fastest JEDEC standard products. Both products have been ramped up to volume production and are being shipped to customers. The new DRAM products, designed by Ramtron and United Memories, Inc. (UMI), are being manufactured at NMBS' state-of-the-art $300 million- dollar fabrication facility in Tateyama, Japan. Colorado Springs-based United Memories, a joint venture company formed by Ramtron and NMBS in 1990, designs leading-edge DRAMs for both companies. UMI is currently developing 16Mb high-performance DRAMs for NMBS as well as specialty DRAM products for Ramtron. Under the terms of the 1988 agreement, the DRAMs are sold exclusively by NMBS with royalties paid to Ramtron from the sales of the products. "The completion of this milestone positions NMBS and Ramtron at the leading-edge of high-performance DRAMs and sets the foundation for higher density DRAMs in the near future," commented Don Carrigan, Ramtron's director of marketing and sales. NMBS' DRAMs address the high-speed segment of the growing DRAM market, which Dataquest, a company of the Dun & Bradstreet Corporation, estimates to be $5 billion in 1992. Applications for the high-speed DRAMs include computer main memory, digital television, facsimile machines, and solid state replacements for magnetic disks used in computer systems. "NMBS expects the 40 nanosecond DRAM products to gain rapid acceptance among manufacturers of 32-bit personal computers and high- performance workstations," stated Shosuke Shinoda, NMB's president. "We are very pleased with the outcome of this co-development program and are excited about our continuing development on fast 16-Megabit DRAM products. This program has definitely helped advance NMBS' position in high-speed DRAM products." NMBS, a group member company of Japan-based Minebea Company Limited, is the world's leading supplier of high-performance DRAMs. Minebea is a multinational corporation with sales in excess of $2 billion annually. Ramtron International Corporation, founded in 1984, develops, manufactures, and markets leading-edge ferroelectric random access memory (FRAM) products based on ferroelectric materials with unique non- volatile and high dielectric constant storage characteristics. 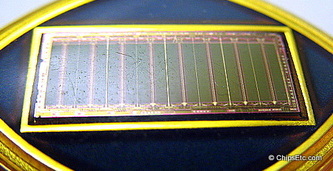 The company also develops and markets complementary metal oxide semiconductor (CMOS) high-performance specialty DRAMs. Ramtron holds over 30 international patents covering its proprietary technologies and products, and has more than 60 additional patents pending.